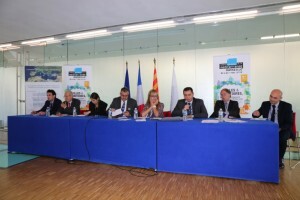 On Thursday November 5, the IPEMED (Institut de Prospective Economique du Monde Méditerranéen) and AVITEM (Agency for Sustainable Mediterranean cities and territories) organised a round-table discussion on waste recycling in the Mediterranean. Household waste collection and recycling is one of the main challenges of sustainable development. “It has become critical that we change our relationship with waste and begin seeing it as a source of wealth,” explains Aymeric Bajot, project coordinator for Access to Essential Services with the Suez Group. The Suez Group will rehabilitate the household waste l andfill site and build a recycling facility for the municipality of Meknes (Morocco). In the last ten years, household waste production has increased by 15% in Morocco. In a country where the informal sector accounts for 40% of the overall economy, Suez has helped create a cooperative in order to provide a legal framework for waste pickers who salvage and sell all kinds of materials from l andfills. This “unregulated” recycling is particularly frequent in Southern Mediterranean countries where organising and managing this practice is a challenge for governments. They need to establish a closed circuit where household waste is recycled and transformed into raw materials. “In Tunisia, we are focussing efforts on compost production. 60% of our waste comes from organic matter,” added Mounir Medhi, President of the Health, Sanitation, and Environment Protection Commission in Sfax (Tunisia). With the financial and technical support of the IPEMed and the City of Nice, Sfax has begun a compost recycling programme.